RummyCircle is rewarding all the loyal online rummy players with 20% assured returns on their deposit amount. The rummy promotion named Depositor’s Delight is a haven for all highrollers who love to play it big but lose their cash while playing cash rummy. Make your deposit on 27th August and get your tickets to special Depositor’s Delight rummy tournament to win cash prizes worth Rs.4 lakhs. The more cash you deposit, the higher will be your returns from the rummy tourney. So, start playing online rummy with RummyCircle and make some cash today! 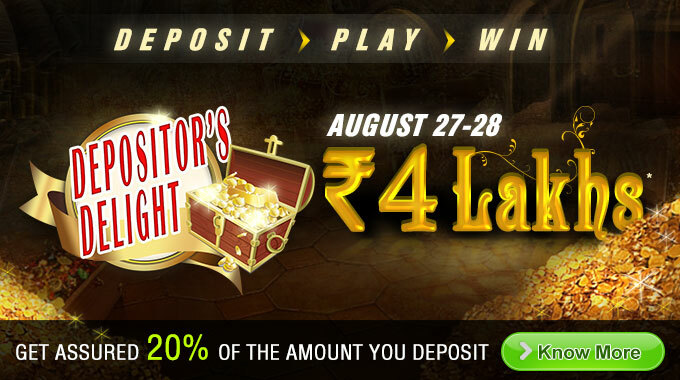 The Depositor’s Delight rummy promotion from RummyCircle will run on 27th August with a tournament on the following day, i.e. 28th August 2015. In order to join the rummy tournament, you have to make your deposit on 27th between times 7:00 PM and 11:00 PM which will give your free Delight Ticket to take part in the tourney and compete for cash prizes worth Rs.4 lakhs. So, mark your dates and make your deposit tomorrow 27th August between 7:00 PM and 11:00 PM to try your luck on cash rummy for a fortune of up to Rs.4 lakhs. If you have any suggestions or feedback on our articles, post it in the comment section below.